By Samantha Phillips | May 2, 2018 at 12:06a.m. 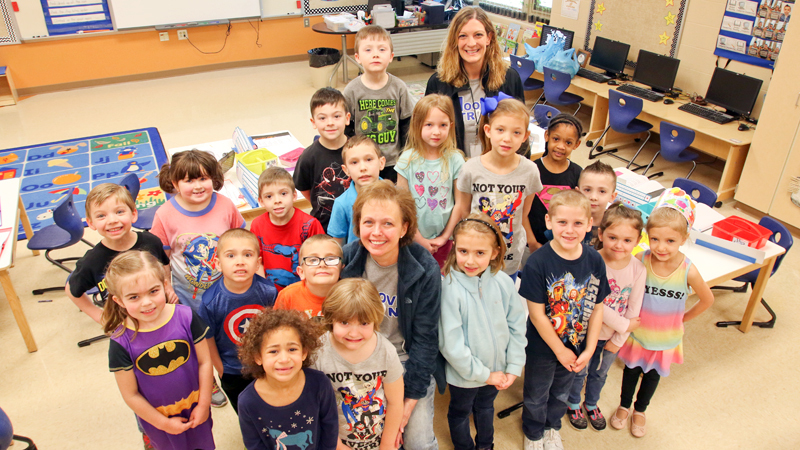 Hubbard Elementary School students pulled out all the stops to make their Pennies for Patients fundraiser in April successful. They were extra motivated because this year’s fundraiser benefits middle-school teacher Jill Hoover, who was diagnosed with stage four cancer two years ago. The students raised $6,223 throughout the month, with a total of 1,435 pounds of coins. Robyn Fette’s fourth-grade class raised the most money at $1,018.05, and won a Chuck E. Cheese party. Gina Paroz’s kindergarten class brought in 224 pounds of coins, the most in the elementary school classes, and will have a Happy Meal lunch. Throughout April, each class was challenged to raise the most money. Fourth-grader Kaylee Smith raised $71.25 by setting up a stand at her house and asking for donations. “I want to help her get the treatments so she feels better,” she said. And fourth-grader Kallissa Smith chose to donate the $50 she had saved in her piggy bank for the fundraiser. “I know she has cancer. I want to raise a lot of money for her to get what she needs,” she said. Just about every student participated, said Brandi Grigsby, the Parent Teacher Association member who spearheaded the campaign. She said she wanted to teach students to do the right thing and was impressed by their compassion. The PTA gathered once a week to count the money that was donated. The money will be given to Hoover during the school’s end-of-school year celebration May 18. Hoover said the middle school also had a basketball fundraiser among other efforts to help her pay medical bills. She was touched by the love from her students and her fellow teachers, who wear “Hoover Strong” shirts. The school does annual fundraisers for organizations such as the Leukemia and Lymphoma Society, but last year they began dedicating fundraisers to people in their community who could use some help. “I don’t have the words to tell them how much of a difference in my life they made,” Hoover said. Anyone who would like to help can donate money at the Hubbard PNC bank branch to the Hubbard Elementary School Parents Association account. May 1, 2018 10:55 p.m.
October 21, 2012 12:05 a.m.
April 13, 2013 12:04 a.m.